Welcome to the reception tonight celebrating the 62nd anniversary of the founding of the People’s Republic of China. 62 years ago China was a poor and weak country badly in need of reconstruction. The founding fathers of the People’s Republic articulated a vision for the future of the country. Their blueprint was a call to action to the Chinese people. · ‘Let us work hard to create our own civilization. This ambition is becoming a reality. China today is a prosperous economy. The impact is there to be seen in China. 62 years of hard work and 33 years of reform and opening-up have transformed my country. China has been turned into the world’s second largest economy and trading nation. China today is a stable and harmonious society. Democracy and rule of law have been further strengthened. Fairness and justice are the shared pursuit of the government and the people. China today is a responsible contributor in the international system. We seek a win-win relationship with all nations. China plays an active and responsible role in international and regional affairs. We are making joint efforts with the world to battle the financial crisis and promote peaceful and sustainable development worldwide. Just 5 hours ago, China’s Tiangong-1 space module was successfully launched. It is another important step in our program to build a space station. Progress in China’s space exploration will make new contribution to international scientific research and peaceful use of space. We have every reason to be proud of what China has achieved in the past 62 years, and have great confidence that China will have a bright future. · China is committed to a path of peaceful development. We see this as the only path leading to China’s modernization and prosperity and greater contribution by China to the progress of human civilization. · China pursues scientific development. In essence it means that in China we take a people-first approach and respect human rights and human values. Our mission is to deliver a prosperous life to all our people. We seek balanced and sustainable development in all aspects. China’s aim is to promote all-round progress in economic, political, cultural, social and ecological fields. 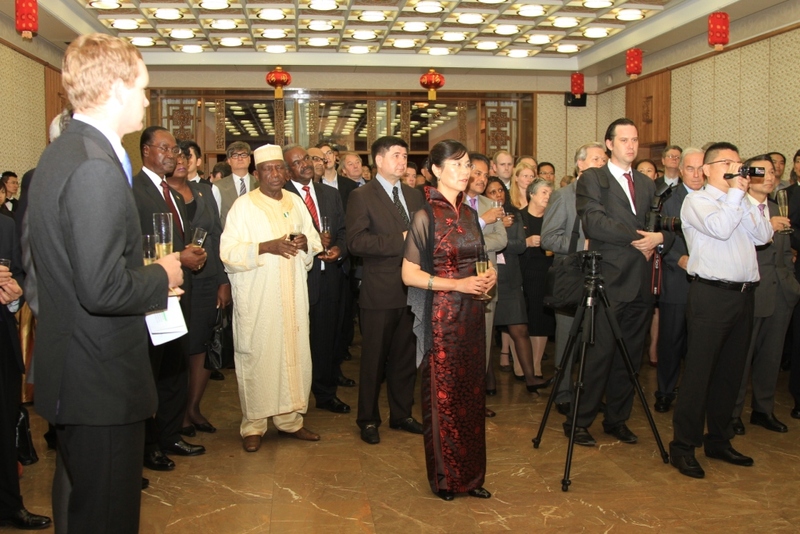 · China relies on itself for addressing challenges of development. We will mainly rely on our own hard work and on reform and innovation to promote economic and social development. And we will not in any way shift problems to others. 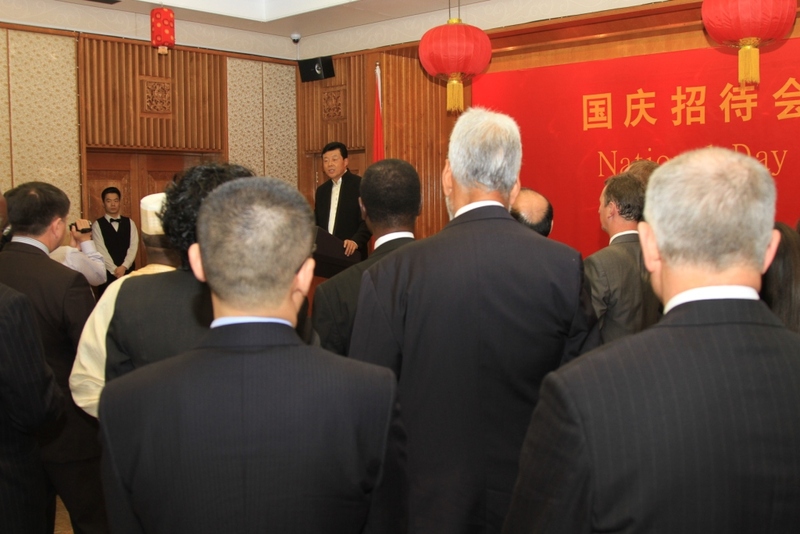 · China’s development is best served by greater openness to the outside world. We are an active player in globalisation. Chinese people welcome the opportunity to learn the best of other civilisations. China will open wider to the world: we will not - and cannot - cut ourselves off from the rest of world. · China’s development is a force for peace in the world. We will never seek invasion, expansion or hegemony. We are a staunch force for world and regional peace and stability. And we are determined to create a favorable environment for China to reach its development goals. · China believes in development by cooperation. We seek the widest possible cooperation with the world. Our aim is to uphold peace, promote development and resolve disputes. China believes in cooperation as an effective channel to address global challenges. · China seeks common development. We will continue to carry out a win-win opening-up policy. While achieving our own development, we will build good relations with other countries and promote shared prosperity of the world. In the course of its peaceful development, China has always regarded Britain as an important partner. Stronger cooperation not only serves Chinese and British interests, but also contributes to world peace and prosperity. China’s cooperation with Britain is mutually beneficial. Our economies are highly complementary. Britain’s strength lies in finance, technology, innovation and business management. China’s growth potential comes from its abundant capital, vast market and large pool of labour. By building a ‘Partnership for Growth, we can contribute to each other’s economic prosperity. China-Britain comprehensive partnership is a contribution to the world. We are both members of the UN Security Council and the G20. We have maintained close communication and coordination in international affairs. Together, we have taken our due responsibilities, risen to challenges and contributed to world peace and development. A close dialogue between Chinese and British leaders is a key factor in the strength of Sino-UK relations. We are encouraged to see a productive year for our relations in 2011. Premier Wen Jiabao and Vice Premier Li Keqiang both visited Britain. Vice Premier Wang Qishan came this month to co-chair the China-UK Economic and Financial Dialogue. Just this week State Councilor Dai Bingguo came to London to co-host the Strategic Dialogue. These visits and dialogues have further increased our common understandings. Both countries now agree on the need to boost our cooperation with new ideas and new approaches, while managing differences on the basis of mutual respect and mutual adjustment. This positive approach will help us to seek common ground despite our differences and promote common development. This year, trade between us has continued its double-digit growth. British exports to China have remained robust. These rose 28.6 percent year-on-year in the first 8 months of this year. That is faster than any of Britain’s top 15 export markets. And China is still a leading investor in Britain. Our people-to-people exchanges have further deepened. The best example is the rapid increase of people of all ages studying Mandarin in many parts of this country. 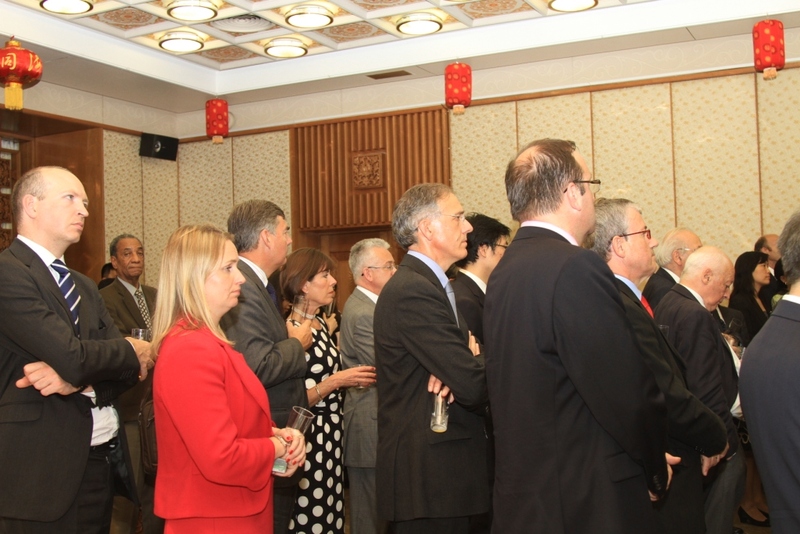 So far 2011 has shown a deepening of Sino-UK relations in all areas. This trend will continue. A couple of months from now, a pair of giant pandas from China will settle in Britain as “Ambassadors of China-UK friendship”. · We will celebrate 40 years of full diplomatic relations. · Britain will host the 30th Summer Olympic Games. · And China has been named the Guest of Honour of the 2012 London Book Fair. I have the confidence that together, we will use these landmark events to great effect. These will be the catalysts to widen exchanges and create ever more productive cooperation between our countries. 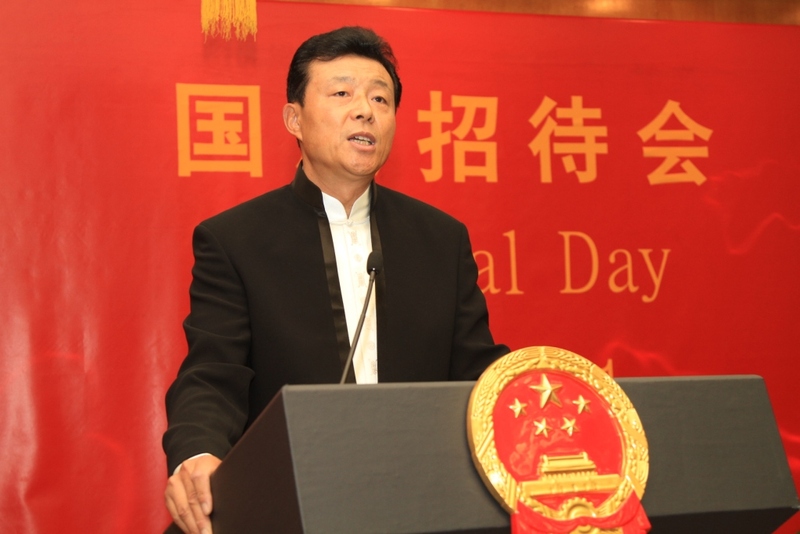 · To the 62nd anniversary of the founding of the People’s Republic of China. · To the fruitful relations between China and Britain. · And to the good health of all guests present.